Hang out with Devil Flanders, visit Springfield Cemetery and enslave humans with Kang. Oh yeah, and search for a clue that'll give you 10 free donuts. Electronic Arts just released another update for The Simpsons: Tapped Out that's sure to please fans. The company worked with the show's writers to add content from Treehouse of Horror XXIII, which airs this Sunday, along with familiar characters and locations from Halloween episodes past. Not only that, but you can collect items to answer a trivia question about Treehouse of Horror XXIII to win 10 free donuts, because who doesn't need more donuts? [I]-New Characters: Do a "diddily deal" with Devil Flanders, ride a broom with Marge the Witch, or enslave earthlings with Kang. 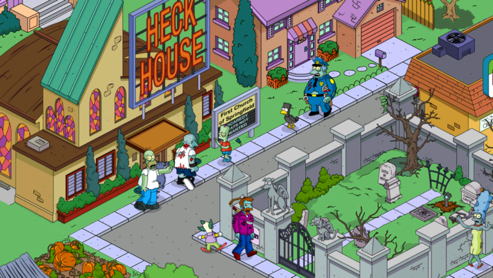 -New Buildings: Incubate Zombies in the Springfield Cemetery, summon demons with the Heck House, or sell some cursed frogurt in the House of Evil. -UFO: Build a Giant Space Laser and show those aliens once and for all who's boss. -Mysterious Artifacts: Find mysterious artifacts and uncover the secrets of the Ancient Mayan Calendar. -Zombies: Squish Zombies as they escape from Springfield Cemetery before they can turn your favorite Simpsons characters into the walking dead!